Miss International 2016 is expected to be another high caliber year, with delegates from powerhouse countries expected to rule the game this coming autumn. With the news of having a new production outfit (last year’s director was sacked due to lack of creativity and resourcefulness) to direct the final night, Miss International 2016 might just be the edition that will bring back the excitement that this Big 5 pageant has been lacking for the past four years. This year, the Tokyo Dome City Hall will host the final night, which means that there will be a real stage with better lighting, unlike in the past three years where an all-white stage resembled that of a funeral ceremony. Starting October 9th, over 70 delegates will be coming to Tokyo, which is considered to be one of the most exciting cities in the world. These lucky delegates will experience Japanese hospitality at its best, with traditional activities like tea ceremony, flower arrangement or ikebana course, tasting of traditional Japanese food and many more! 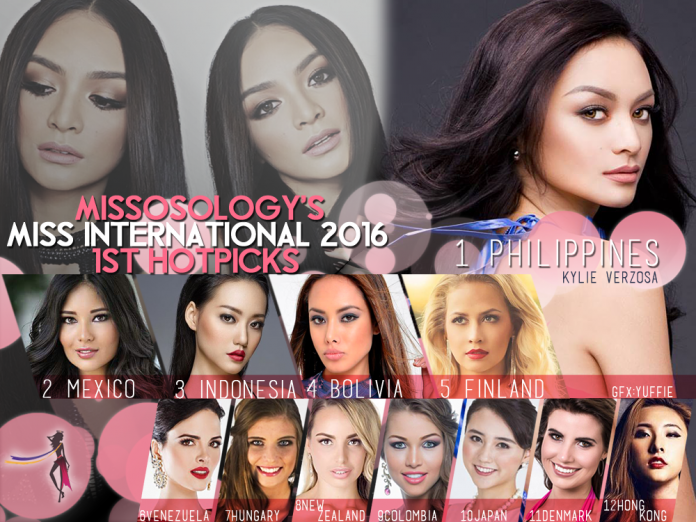 Several weeks before the pageant started last year, Missosology’s 1st Official Hot Picks for Miss International 2015 was topped by Edymar Martinez. And as expected, she won the pageant with ease, making it Venezuela’s record-breaking 7th win! This year’s Venezuelan bet, Jessica Duarte is pegged at 6th place in our 1st Hot Picks. Topping our first list, however, is the delegate from the Philippines, Kylie Verzosa, who is on the running for her country’s sixth Miss International crown. This fashion model was a strong contender for the Miss Universe Philippines crown when she competed earlier this year at Bb. Pilipinas 2016, but some pageant experts were saying that her poor styling during the final night had cost her the crown. But, the Bb. Pilipinas International title may just be a blessing in disguise because the very photogenic Kylie has all the goods to win the international title in Tokyo, with the proper guidance and training of her mentors and fellow beauty queens from the Philippines. As early as now, a lot of Kylie fans have already booked their flight for Japan to watch and cheer for her at the Tokyo Dome City Hall. In second spot is the newly appointed Miss Internacional Mexico, Geraldine Ponce. Like Kylie, Geraldine was also a major favorite for the Miss Universe Mexico title, but was only adjudged 2nd Runner-up during the Nuestra Belleza Mexico 2016 pageant. Mexico has a unique way of selecting their Miss International delegate, and this year, they appointed the 2nd Runner-up of NBM to go to Tokyo. Last year, Lorena Sevilla, who was 3rd Runner-up at NBM 2014, was surprisingly appointed as Miss International Mexico while she was having a rehearsal in a room. Vianey Vazquez who was 2nd Runner-up at NBM 2013 was appointed in 2014, while Lucero Montemayor, who was 1st Runner-up at NBM 2012 was later appointed as Miss International Mexico 2013. There is no consistency with the way a Mexican delegate to Miss International is being selected, and what basis they are being judged. In third place is the very beautiful Felicia Hwang of Indonesia, who is determined to give Indonesia its best placement at Miss International. Indonesia’s best placement was a 2nd Runner-up finish in 1977, courtesy of Indri Hapsari Soeharto. When Felicia represented Lampung at the annual Puteri Indonesia 2016 pageant, she was pegged as one of the favorites for the Top 3 spot, and she did not disappoint her fans. The reigning Miss International, Edymar Martinez, was present during her pageant which some pageant analysts may consider as an advantage. We believe, however, that Felicia can make it on her own merits because she is smart and charismatic. In fourth place is Bolivia‘s Katherine Añazgo Orozco, who was another major favorite in her national pageant, but did not win the top plum. Bolivian fans were disappointed with the result of Miss Bolivia 2016, because the beautiful straight-haired Katherine, who also has dominant native Indian features, was not crowned Miss Bolivia. The crown went to the blonde bet of Santa Cruz, Antonella Moscatelli. Katherine has the exotic look that is appealing among pageant fans, especially foreigners. While this may be considered as an opportunity that is lost for Bolivia at Miss Universe, she is a welcome addition to the competitive year of Miss International. In fifth place, and never to be underestimated, is the bet from Finland, Emilia Seppänen, the statuesque blonde who was 2nd Runner-up at Miss Suomi 2016. Finland has a very good track record at Miss International whenever it is being held in Japan. Coincidentally, the last three girls from Finland to place in the winning circle were all blondes: Sussana Laine who was 2nd Runner-up in 2005; Viivi Suominen, 1st Runner-up in 2012; and Milla Romppanen, 4th Runner-up in 2014. The only blonde Miss Finland who failed to place was Joanna Väre in 2007, but that could not be helped because during the pageant period she gained weight. This year, Emilia’s angelic beauty will surely be a hit in Tokyo! Venezuela‘s Jessica Duarte, as mentioned earlier, is in sixth place and that may improve as time goes by. Who can forget her mind blowing evening gown presentation at Miss Venezuela 2015, and her amazing stage presence all throughout the competition? At seventh place is Csillag Szabo of Hungary, who is probably the most academically gifted delegate this year. A student at the prestigious National University of Public Service, Csillag’s ambition is to become Hungary’s first female prime minister. She is a basketball player and great speaker to boot, proof of which is her ability to expound political issues within her native Hungary, as well as Europe. Jessica Tyson of New Zealand enters the Top 12 at eighth place, although many thought that Jessica should have won Miss World New Zealand 2016 because of her personality and beauty. Daniela Herrera Avendaño of Colombia follows her at 9th place, and we believe that Colombia will come back stronger this year after a disappointing non-placement at last year’s pagent. Colombia placed in the Top 5 for two straight years, in 2013 and 2014. Jyunna Yamagata of Japan is in tenth place. At 164 cm, she may just be the shortest delegate ever sent by Japan at Miss International, but her facial beauty cannot be ignored. Coming from the tsunami-devastated prefecture of Iwate, this 21-year-old university student became an inspirational figure in her hometown, due to her victory at Miss International Japan 2016. After three straight years of non-placement, Japan cannot afford to miss the first cut for the fourth time! Sara Danielsen of Denmark is in 11th place, and with the guidance of her national team from Face of Denmark, Sara is set to put her country back on the map at this year’s Miss International pageant. Despite looking demure on stage, she actually has a vivacious personality, and has a good sense of personal discipline. While finishing our list at 12th place is Kelly Chan, a model and university student from Hong Kong, who was recently appointed by her national organization. While many more delegates are about to be known, especially the ones coming from the African continent, India and Brazil, we are confident that this initial list of delegates may just be the ones to watch out for when the official competition begins in October. So, what do you think of our list?